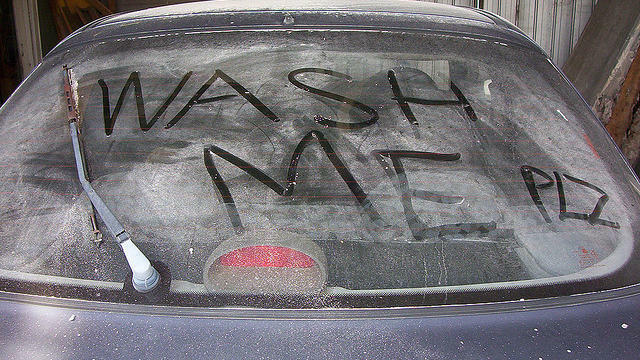 There’s a reason even diehard auto lovers across California are letting the dirt and dust build up on their windshields: Washing a car carelessly during the drought can be costly. It turns out, using a hose without a shut off nozzle can waste over 100 gallons of water in just 10 minutes. And even with reclamation mechanisms, drive through washes still use around 35 gallons of water per car. But what if we told you that it’s possible to flawlessly clean your car with less than a cup of water? Patrick Willis and Svet Pavlov, co-owners of WaterLess Touch Car Wash in San Francisco say it can be done with nothing more than a spray bottle filled with waterless formula and two microfiber towels. Here’s how it works: Start by wetting one microfiber towel with formula (the duo recommends Eco Green Auto Clean Auto Wash) to the point of nearly soaking it, and use a spray bottle filled with the same wash to wet the portion of your vehicle you plan to clean. Gently wipe away at your car in a circular motion with the wet towel and again with the dry microfiber towel until there is no fogginess or residue left. The same technique can be used with most waterless formulas on wheels, and even on some interior plastics—just be sure to check with the manufacturer first and always use a biodegradable spray. “Waterless washing is a rewarding way to save some water, and anyone who tries it will be pleased with the way their car looks: no streaks, no water spots, and a nice clear shine,” Willis says. If you prefer to have someone else do the dirty work, Willis says that professional waterless washes are starting to pop up all over California. Most, like his business, are mobile—meaning the car wash team comes to your home or office. But drive-through waterless washes are starting to take off, too.